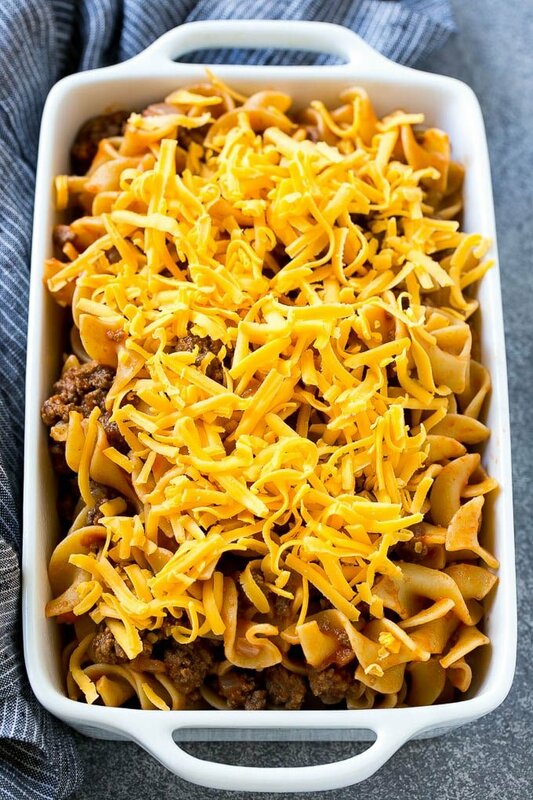 This beef noodle casserole is ground beef in a rich tomato sauce, tossed with egg noodles then topped with plenty of cheese and baked to perfection. An easy comfort food dinner that’s perfect for feeding a crowd. When I have a package of hamburger in the fridge, I often make this simple yet hearty beef casserole. It’s cheesy, kid friendly, and quick to whip up on a busy night. 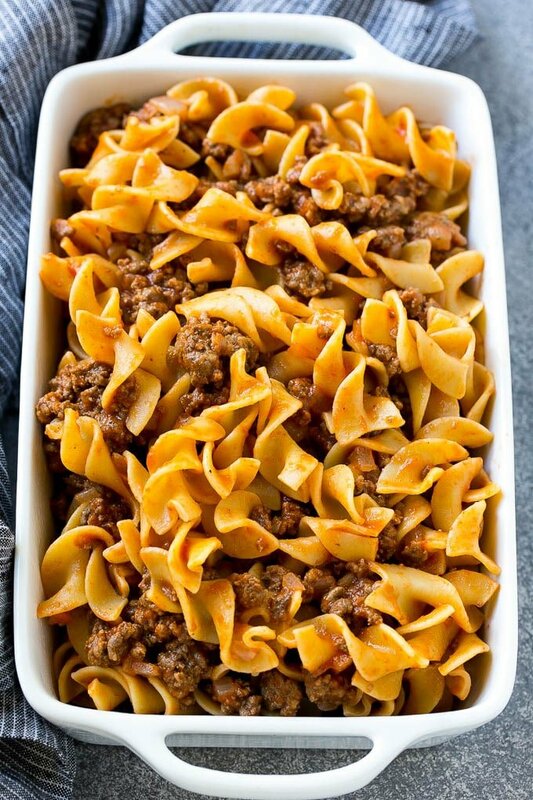 I love a good casserole, and this beef noodle casserole is always on our regular dinner menu rotation. 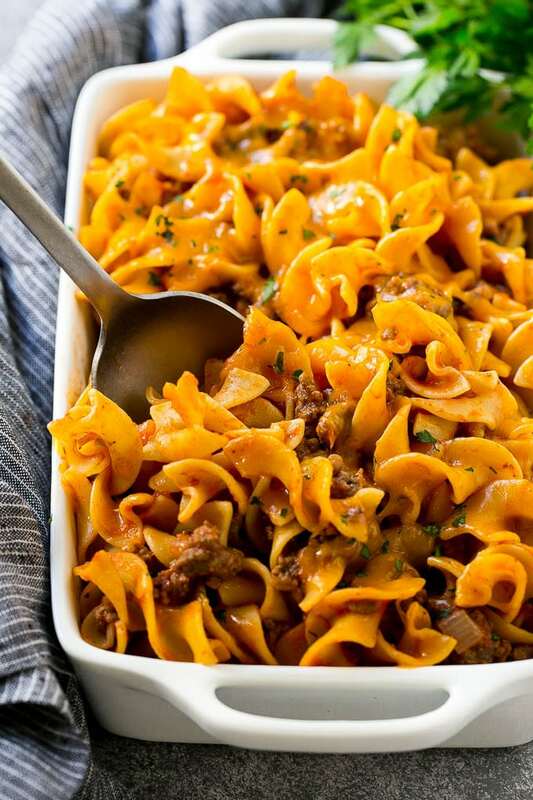 It’s a simple yet delicious combination of ground beef, tomato sauce, egg noodles and cheese. Put it all together and bake until melted and bubbly, then serve it to your family and watch the compliments roll in! The first step to making beef noodle casserole is to brown some ground beef with onions and garlic. I use 90% lean ground beef, it’s got plenty of flavor but isn’t overly fatty. I cut the onions small so that my kids won’t even notice that they’re in this dish. After the beef is cooked, some seasonings and tomato sauce go into the pan. While the beef is cooking, I boil my egg noodles. The noodles go into the pan with the beef and everything gets mixed together and spread into a baking dish. The finishing touch is shredded cheddar cheese, and plenty of it! I add a sprinkling of parsley at the very end, but that’s an optional step. Can beef noodle casserole be made in advance? Yes, you can make beef noodle casserole in advance. Simply prepare the beef and tomato sauce and toss it with the noodles, then cover and refrigerate. Right before you’re ready to bake your casserole, add the cheese and pop it in the oven. You’ll need to add about 10-15 more minutes to the bake time to compensate for the fact that you’re starting with a chilled casserole. 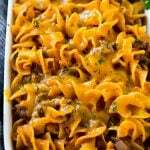 This beef noodle casserole is a great basic recipe that can be altered in different ways to be customized to your tastes. Some variations include using ground turkey instead of beef, adding more vegetables like peas or green beans, using macaroni instead of egg noodles and trying different types of cheese for the topping. 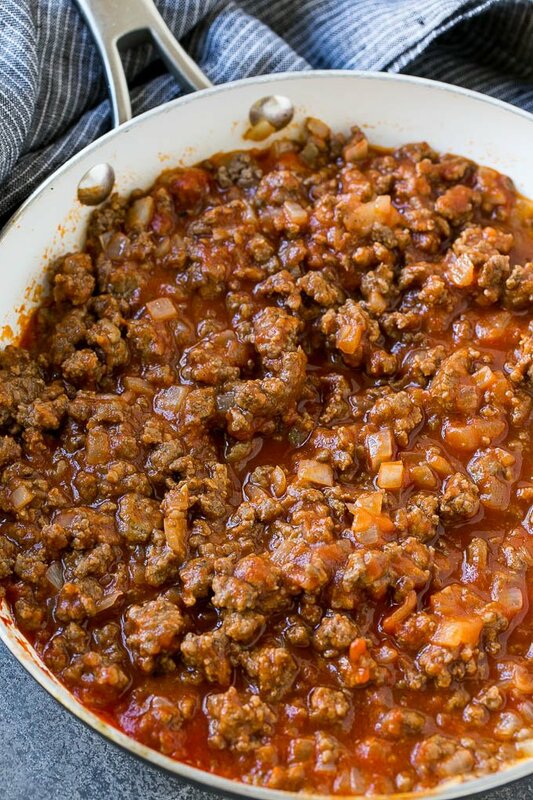 If you’re craving comfort food tonight, grab a container of ground beef and try this casserole, you won’t be disappointed. 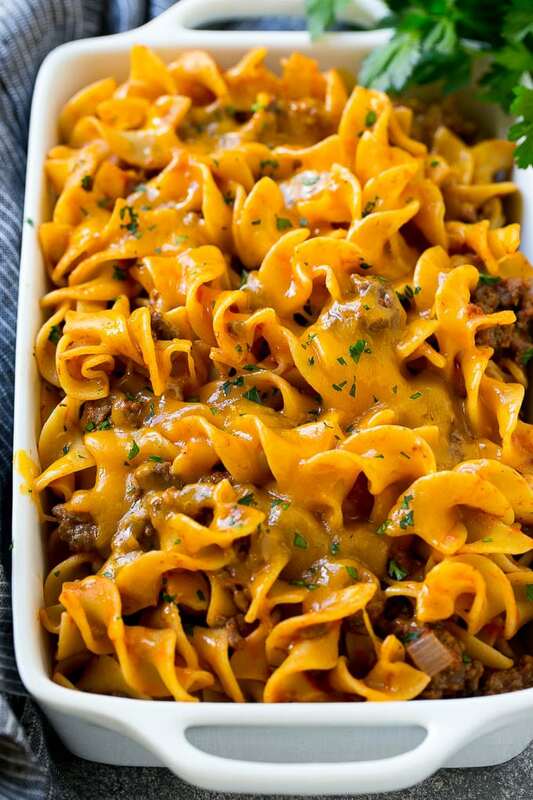 This beef noodle casserole is ground beef in a rich tomato sauce, tossed with egg noodles then topped with plenty of cheese and baked to perfection. An easy comfort food dinner that's perfect for feeding a crowd. Bring a pot of salted water to a boil; add the egg noodles and cook according to package directions. Preheat the oven to 400 degrees F.
While the noodles are cooking, heat the olive oil in a large pan over medium high heat. Add the ground beef to the pan and cook for 4-5 minutes, breaking up the meat with a spatula. Add the onion and garlic to the pan and cook for an additional 5 minutes, or until onion has softened and beef is cooked through. Season with salt and pepper to taste. Add the tomato sauce, tomatoes and Italian seasoning to the beef and stir to combine. Drain the noodles and add to the pan with the beef; toss to combine. Pour the beef and noodle mixture into a 9"x13" baking pan that's been coated in cooking spray. Top with cheddar cheese. Bake for 10-15 minutes or until cheese is melted. Sprinkle with parsley and serve. This was tasty and easy! I used ground turkey instead of beef and only one cup of cheese but added a little more sauce. Will definitely make again. Would it be ok to leave off the cheese? You could do that, but in that case I’d add more tomato sauce because it could be a little dry without the cheese. You can, although the noodles will soften up in the freezer, so as long as you’re ok with that it should freeze just fine. I dont have egg noodles can ziti or rigatoni work?